This is so interesting. Now I’m trying to remember the difference between cast iron and smelted iron… I just learned that the difference is between cast and wrought iron. Wrought Iron is iron that has been heated and then worked with tools. Cast Iron is iron that has been melted, poured into a mold, and allowed to solidify. The difference came to mind because when I lived in Liberia, there still was so-called “Kissi money” circulating. It was made of iron by village blacksmiths, and circulated into the last century along with various other currencies. I rather like the idea of a village blacksmith knocking out their own currency, a kind of quantitative easing? There were many thing in the museum, made of iron that surprised me, whilst I’d seen garden benches before, I’d not seen household furniture, here a table chair and wall cupboard, how on earth did you fix a cast iron cupboard to a wall,? That’s what I want to know. It’s difficult enough hanging a picture at this house, with its ancient plaster. And whilst our oil fired AGA is no longer with us (it went on to a new home and will be working away somewhere) we now have a dual fuel range cooker, made by the same company, but not it seems at this foundry. I find this newspaper image so sad and poignant, as the employees left for the last time, after 309 years of production, they tied their boots to the iconic gates. 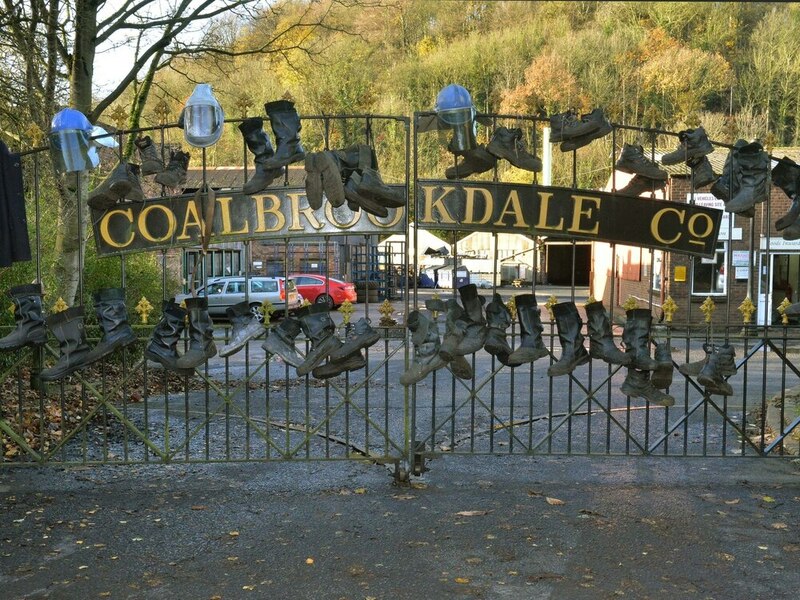 Categories: Family, History, Thoughts, Travel | Tags: AGA, Coalbrookdale, UK Industry | Permalink.